Selena, age 3 1/2, knows what she likes and doesn’t like. Likes people. Other animals, not so much. Pay her a visit at PAWS Animal Shelter. Energetic and loving Buddy, a Beagle-Spaniel mix, is 9 months old and ready for adoption at the Champaign County Animal Welfare League. Karson, a one-year-old Lab mix, was a stray, but now is safe at Barely Used Pets awaiting prospective owners to pay him a call. 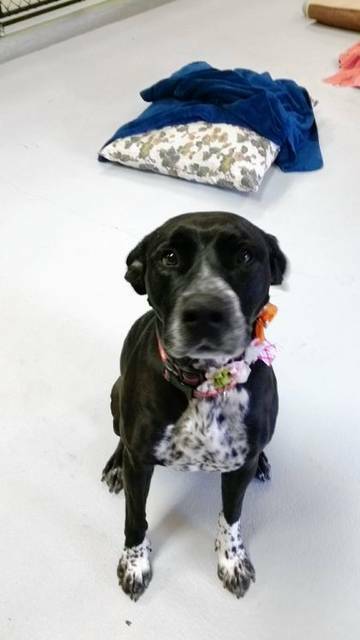 Everyone meet Selena, a 3 1/2-year-old Pointer mix, up to date on shots, heartworm-negative, spayed and on monthly flea & heart worm preventative. Selena does great with people and children, loves to play ball and tug of war. She is selective with other dogs and does not do well with small animals. She does not do well at all with cats. PAWS is located at 1535 W. U.S. Route 36, just west of Urbana. Contact PAWS at 937-653-6233 or pawsurbana@hotmail.com for information about volunteer opportunities and donation needs. Hours are Tuesday thru Friday noon to 5 p.m. and Saturday noon to 4 p.m. 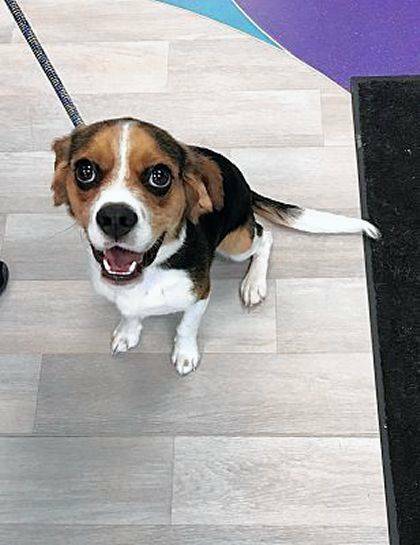 The Champaign County Animal Welfare League (CCAWL) pet of the week is Buddy, a 9-month-old Beagle/Spaniel mix. He is an owner surrender through no fault of his own. 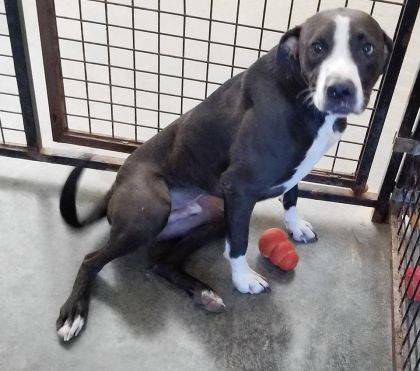 Buddy is high energy, intelligent, loving, and a total love bug. He does well on a leash and is crate trained. Buddy seems to be house-trained, but if not, it won’t take long for him to get the hang of it. He is dog friendly and hasn’t been cat tested, but we can do that for you if you wish. Buddy loves attention from people and would be a great hiking friend. He is neutered, microchipped and current on all vaccinations including, rabies, Bordetella, Bivalent Flu, and Da2PPL. Buddy has been dewormed, heart worm tested negative and is on flea and heart worm prevention. You must have an approved adoption application, which can be obtained at our facility or found on ourwebpagewww.champaigncoanimalwelfareleague.com. Our adoption fee for canines is $150 cash, credit or debit card only. Check the website for donation needs. The facility is located at 3858 state Route 56, Mechanicsburg, OH 43044. For more information,please call 937-834-5236. Memberships are available that will allow you to have access to our 72-acre campus. You’ll be able to use the agility course,indoor/outdoor dog park, grooming facility, and trails. An individual membership is $100 for the year and a family membership is $150 a year. The Mixins & Fixins restaurant in Mechanicsburg will be doing a 1st Thursday of every month Beef & Noodle Dinner with 50 percent of all proceeds going to CCAWL. Please be sure to thank them for their support. The adoption fee for felines is $60 cash, credit or debit only. My name is Karson. I was a stray in Champaign County and I was picked up by the dog warden. I am a Lab Mix boy and I weigh 48 pounds. I am so glad I am safe and have a belly full of food every day here at Barely Used Pets! I am meeting so many other dogs on the playground. I am about 1 year old, neutered, heartworm free and they say I appear to be house trained. I walk on a leash, but I kind of like to pull so you might want to work with me a little on leash stuff. They are working with me now on it. I get along with the other dogs and didn’t pay any attention to Lollipop, the resident cat. I love people. My adoption fee is $150 and that includes my dog license. Won’t you please come out and see me and maybe we can do a little leash walking. I just need a chance to be happy and safe with my new forever family. Visitors and potential adopters are welcome during regular hours. Please visit our website: http://www.barelyusedpets.com. Also, like us on Facebook at Barely Used Pets Rescue (put spaces between the words). Barely Used Pets is located at 844 Jackson Hill Road in Urbana. You can give us a call at 937-869-8090. Our regular hours are Sunday 1-4 p.m., Wednesday and Thursdays 11 a.m.-6 p.m.,Fridays 11 a.m.-5 p.m. and Saturday 11 a.m.-2 p.m. Contact the shelter for volunteer opportunities and donation needs. https://www.urbanacitizen.com/wp-content/uploads/sites/36/2018/07/web1_PawsDogWeb.jpgSelena, age 3 1/2, knows what she likes and doesn’t like. Likes people. Other animals, not so much. Pay her a visit at PAWS Animal Shelter. https://www.urbanacitizen.com/wp-content/uploads/sites/36/2018/07/web1_LeagueDogWeb-1.jpegEnergetic and loving Buddy, a Beagle-Spaniel mix, is 9 months old and ready for adoption at the Champaign County Animal Welfare League. https://www.urbanacitizen.com/wp-content/uploads/sites/36/2018/07/web1_BaarelyWeb.jpgKarson, a one-year-old Lab mix, was a stray, but now is safe at Barely Used Pets awaiting prospective owners to pay him a call.